News of foldable smartphones has been doing the rounds for years, but to date we’ve not seen any of the leaks, renders and prototypes actually come to fruition – however, finally in 2017 that might all change. 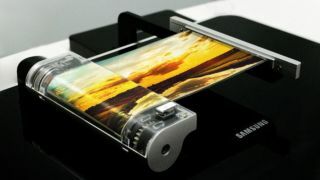 According to ETNews, Samsung currently has two foldable smartphones in development, with one of them launching in early 2017 - which matches up with a leak from May suggesting a similar time frame. The phone slated for a limited release early next year is said to have two separate flat displays either side of a hinge, while the second device is said to have a single flexible OLED screen and will arrive some time after its dual-screen brother. Samsung's already heavily tipped to be working on a foldable phone under the monkier of the Samsung Galaxy X - a phone that's been rumored for over five years. It’s safe to assume then, that we will get foldable, flexible smartphones from Samsung at some point, but whether this report is completely true is still unclear. Take the report here with a pinch of the salt, as the source has a hit and miss reputation when it comes to leaks – but we’re keeping our fingers firmly crossed and will be hoping we see something at CES 2017 or MWC 2017.